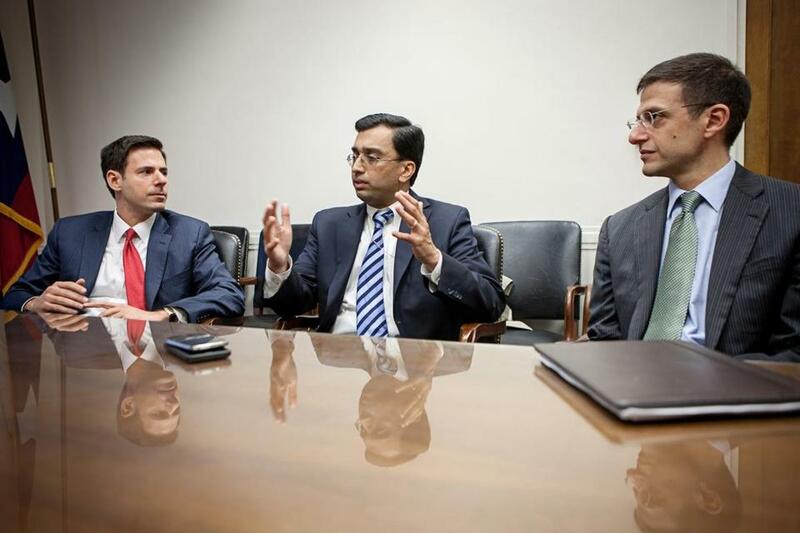 From left: John Carlin, the assistant attorney general for national security; Rajesh De, chief lawyer for the National Security Agency; and Adam Szubin, director of the Department of the Treasury’s Office of Foreign Assets Control, have been friends since their days at Harvard Law School. WASHINGTON — When Rajesh De, the chief lawyer for the National Security Agency, needs a special court order so the agency can spy on potential security threats, he turns to John P. Carlin and his team of attorneys in the Justice Department to advocate for the new authority. But De doesn’t always get what he wants from his former Harvard Law School roommate. 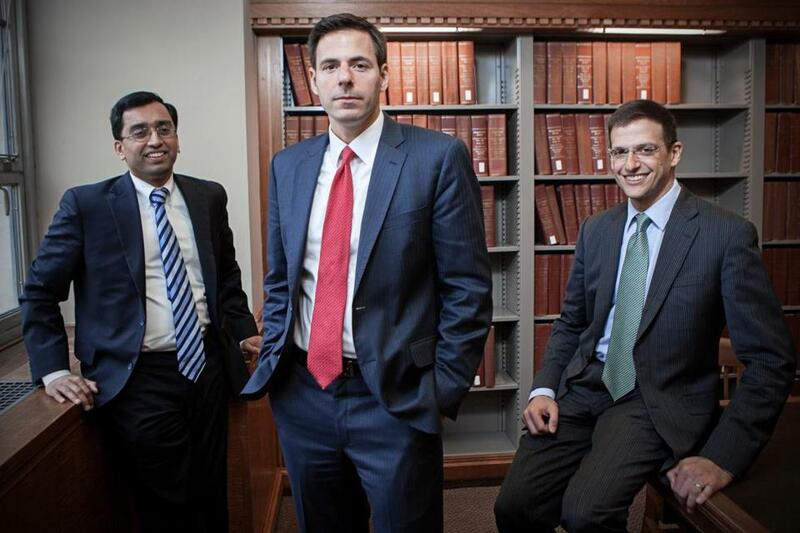 In a twist of fate they could hardly have predicted a decade and a half ago in Cambridge, they along with another friend from the Class of 1999 are now among the most influential legal minds in the nation’s war on terrorism. Their mission is to strike one of the most weighty — and controversial — balancing acts of the Obama administration: fighting terrorism while protecting the civil liberties of Americans. It is a far cry from their theoretical debates in law school. Their decisions have direct implications on how much the federal gov-ernment spies on its residents in the name of security. And compatriots or not, what one friend is seeking, the other sometimes declines. Another key partner is their other close friend and former classmate, Adam Szubin, the Treasury Department official responsible for cutting off the flow of money to terrorist groups. The trio, now in their early 40s, have a unique relationship. They often finish each other’s sentences. Their wives socialize — De and Carlin met their spouses in Cambridge — and Carlin and Szubin live in the same neighborhood. When they get together, they often reminisce about the drab green house where De and Carlin lived on Roberts Road and their favorite pizza shop. But their professional interaction could scarcely be more serious. De became general counsel of the NSA in 2012, not long before the agency came under intense scrutiny after disclosures by former contractor Edward Snowden about its gathering of bulk personal data of US citizens and other programs. That means Carlin, or one of his staff of lawyers, represents the NSA before a secret court set up by the Foreign Intelligence Surveillance Act, or FISA. But Carlin, who took on his post early this year, also has a responsibility to assess whether the subject of the NSA request is legitimate. “When we go to the FISA court, unlike if I were a defense attorney representing an individual client, I shouldn’t push to the line,” he explained. If Szubin, who has been director of the Department of the Treasury’s Office of Foreign Assets Control since 2006, wants to sanction a foreign country, company, or individual for financing terrorism, he has to coordinate with his old friend De, including getting permission to use highly classified material gathered by the NSA to designate an entity as a supporter of terrorism. The friends’ unique personal ties have broken down bureaucratic barriers between their respective agencies, they say. De (left), Carlin (center), and Szubin. Indeed, they insist their legal views are not always in sync about where counterterrorism ends and personal freedoms begin. He said the three friends make a conscious effort to avoid “group think” and try to challenge each other’s positions. What they all agree on is that none anticipated working in what before the Sept. 11, 2001, attacks was considered something of a legal backwater: national security law. De initially focused on international human rights law, and when he joined the Justice Department he landed a job in the antitrust division. Carlin gravitated toward criminal law and represented indigent clients in Roxbury and Dorchester during law school. When he went to work for the Justice Department with De, he joined the tax division (the pair also lived together their first year in Washington). Szubin, meanwhile, was interested in constitutional law, particularly religious and press freedoms, and went to work defending the government against civil lawsuits. “I would have been stunned if you told me [back then] I’d be doing this today,” Szubin said. It was only after the 9/11 attacks that they were drawn into the fight themselves. “I felt like I wanted to contribute in a different way,” recalled De. Szubin soon found himself defending the office he now runs against a lawsuit filed by three Islamic charities that were sanctioned after 9/11 for funding terrorist groups. Carlin said he was inspired in part by what De and Szubin were doing; by 2007 he was working for then-FBI director Robert Mueller. Though operating mostly in the background, all three now play critical roles in ensuring that in its zeal to prevent another 9/11 the federal government doesn’t go too far. De has spent much time dealing with the fallout from Snowden’s disclosures about the NSA’s intelligence-gathering programs and methods. To critics of the agency’s methods, he insists that the NSA is a “highly regulated entity” — including by his old roommate. So he consults — and argues — with his former classmates about it. Just like the old days.